On October 29th, 2009, the FIA elected Jean Todt as FIA President (against rival Ari Vatanen) for North America; Central and South America; Asia Pacific; and Europe, Africa, and the Middle East. To provide such leadership I would promote three major themes for the new term of the Presidency of the FIA. Affordability and Competition: In order for mobility and motor sport to grow they must be affordable and accessible to as many people as possible. Reducing costs in Formula One is relevant to all levels and disciplines of motor sport as our ASNs know well. At the same time reducing the cost of motoring, whilst ensuring it is as safe and sustainable as possible, is a vital imperative for the FIA’s mobility clubs. The best means of achieving affordability is by promoting fair and open competition on both road and track. Innovation and Excellence: The FIA must always be at the cutting edge of innovative technologies, policies and management systems. In the sport we demonstrate world class ability to combine fair competition, entertainment and risk management by applying this approach. The same ingredients are needed to encourage freedom of mobility, to overcome congestion, to protect the environment and promote safety on our roads. By promoting innovation the FIA will extend its global reputation for excellence both in sport and in meeting the needs of ordinary motorists. Teamwork and Co-operation: The FIA works best when it works together. We need a Federation that works as a team with the President, his Deputies, and the World Councils engaged with our clubs, their membership and their vital volunteers. Teamwork, which has been the hallmark of my management style for the last 28 years, requires a strong commitment to communication, delegation and transparency among our clubs and stakeholders. We must ensure as well that all world regions can play their part and review the statutes of the FIA so that they meet the requirements of a growing membership. To make the membership grow we should promote synergy and co-operation between the sporting and mobility clubs of the membership in all world regions. But, for now, we care about why El Presidente was in Beirut between Thursday April 15th and Saturday April 17th, 2010. It was said that he was touring the city on Thursday and that he planned to visit the Beirut Motor Show the following day at 3PM. His schedule included a one-hour tour of the show and a one-hour press conference. I managed to get there at 3:30pm and witnesses led me to him. You won’t miss him. He’s the one in a constant crowd. The camera’s and bodyguards and men dressed in suits. I thought I’d never get around to seeing him. The fact that I was in a suit, made it easier, and I managed to blend in nicely. I followed him for an hour, as he stopped by Range Rover, Chevrolet, Dodge, Chrysler, and Mercedes-Benz. He left to the press conference and I wasn’t able to gather my guts for a picture until it ended. A quick, ‘hello’ and I went for it. 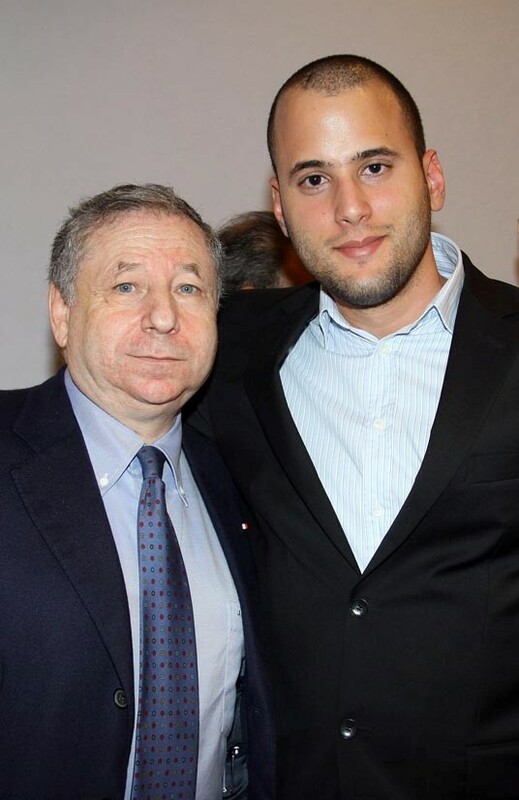 Jean Todt takes a second to pose with a fan: Me. Jean Todt is in the Middle East, specifically in Lebanon to see the country for himself. There are always rumors going around – Lebanon is in debt and Lebanon is at war. Todt came, he toured and he saw quite well. He wanted to see if Lebanon is a suitable venue for Formula 1 and WRC. The only, and most important, item lacking in this equation (Lebanon + Money = Lebanon GP) is money. It cost approximately $150 million to construct the Bahrain GP and the same kind of money is needed if the Lebanese ever want to say ‘Lebanon’ and ‘F1’ in the same sentence. At the end of the day, you need money to make money, and the last time I heard, Lebanon is in debt – a big debt. I can still dream, however, of a day where I don’t need to fly to Bahrain or Abu Dhabi to watch a Formula 1 race. I sure hope the dram of The Lebanese F1 comes true. What do you do for a living Ramez? I am a tech journalist. Have no fear, ever since 1996 the dream of Dr Khaled A . Taki began in earnest by designing a circuit to have a Formula One Grand Prix Race for Beirut and it has never stopped, first attempt was the circuit in Ramlet el baida , known as the Hariri Beirut Circuit and was presented to the FIA visa-vi the ATCL in 1996 and got a positive response except that at the time the FIA did not want any more street circuits. Then an attempt was done to do the same at Solidere streets but that did not materialize either and the repose was ‘ purpose built circuit is what is required , then in the year 2000 Dr Khaled Taki once again designed a possible Formula One Circuit except that this time it was not a street circuit . Due to the turmoil in Lebanon ( 2000-2010) nothing was done but now with a new parliament , president , prime minister and active house speaker, the project has been revived watch out for some good news and a great surprise soon !